Big held an open day at Bury Fire Station on 4th September 2011. 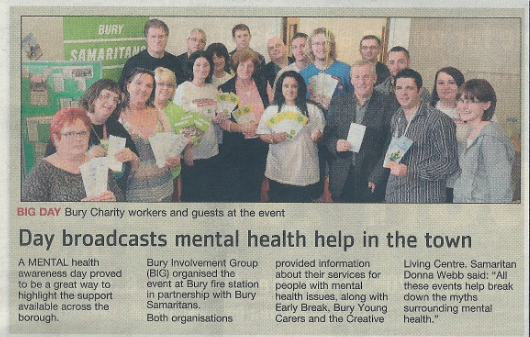 Alongside us were other charity organisations including The Samaritans, Early break, Young Carers and Creative Living. Free complimentary therapies and snacks were also available. This event aimed to explore some of the core needs to improve services within Bury and to identify needs of service users. Whilst there is a growing interest in mental health awareness the potential for signposting service users to mental health services is essential and this is what the role of BIG provides.Learning resources and guidance was given by BIG in order to help recovery for those suffering a range of mental health issues. Visitors were from a variety of backgrounds and ages and evaluation forms were filled in which gave BIG an opportunity to improve the services we provide. One mental health service user stated “It’s so useful to know I can approach an organisation that provides support and help to improve the recovery of my illness. There is nothing like this in Bury and now I know I have somewhere free to go in the evenings for advice and support, this has prevented me isolating myself”. On Monday October people from across Bury helped raise awareness and remove the stigma attached to mental health and celebrate World Mental Health Day at The Jinnah Day Care Centre, Alfred Street, Bury. 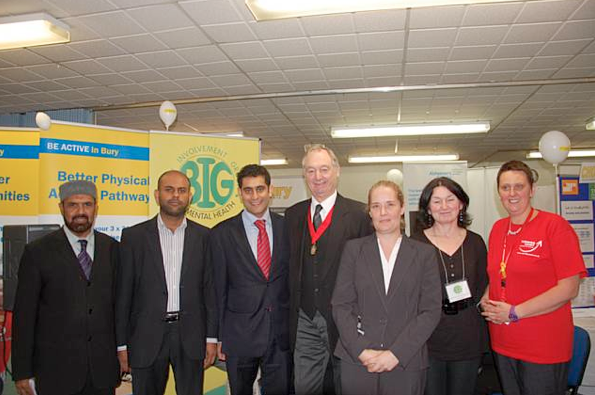 The event was a great success with around 200 people attending the day. There were speeches from Councillor Rishi Shori, Dr Sadiq, Councillor John Byrne Deputy Mayor of Bury, BIG in Mental Health, Turning Point and special guest speaker Anna Dalton from Primary Care Mental Health.